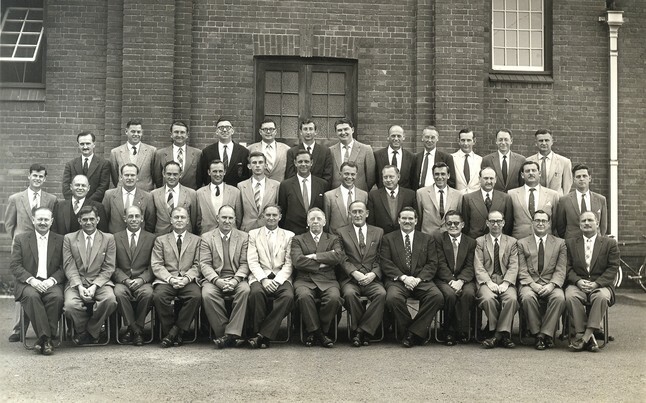 Here are official staff photos showing the men who taught at DHS from 1958-1961. There were quite a few memorable characters among them! There are also two bonus photos at the end. 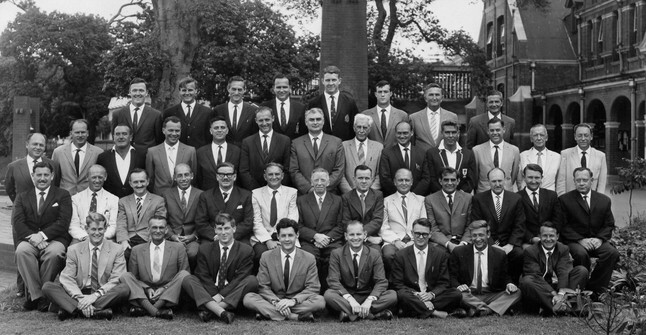 The first is the staff in 1964, showing the same old stalwarts looking much the same as when we first set eyes on them in 1958. 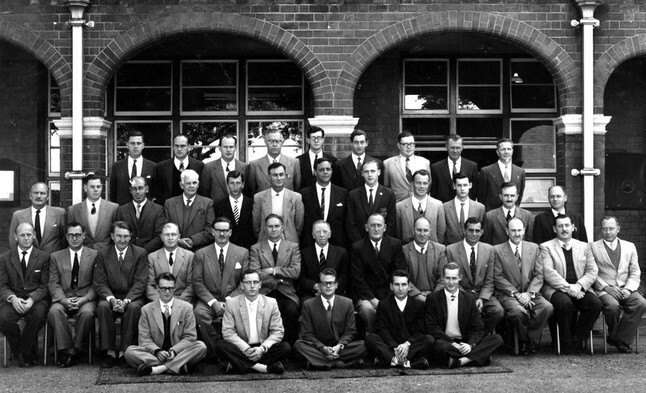 The second is the staff of 1952, showing several of our teachers looking more youthful, six years before our arrival. Note the familiar stalwarts in the second row! 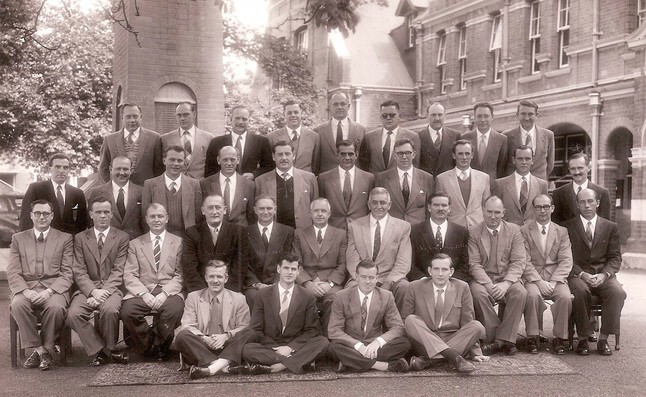 There are three future headmasters of DHS in this picture -- Ken Tomlinson (back row second from right), Des Thompson (then vice-principal, next to McIver on the right), and Trevor Bennison (front row, third from left). 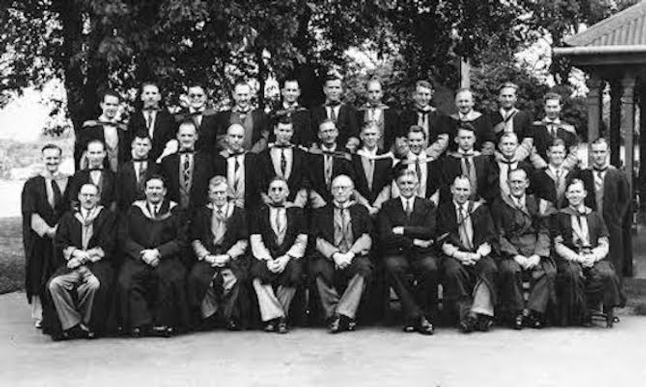 The 1952 teachers are wearing their full academic gowns and hoods for their photo (except for Bill Payn, who didn't have a degree). The practice had disappeared in staff photos of our day. 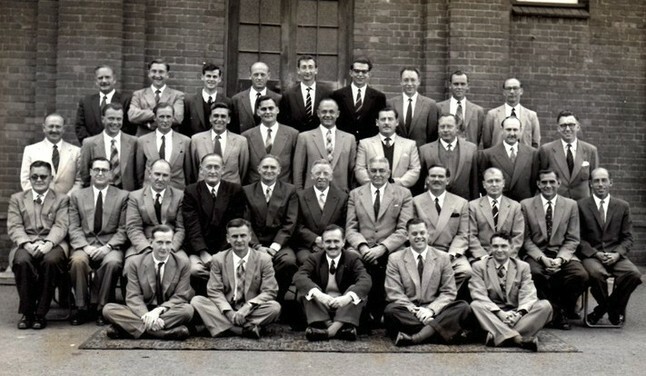 In the back row are Dan Pienaar, Normal Lucas, Des Thompson, Jiggs Grey, Maniac McMichael, and Jock MacKay. In the middle are Jeff Chater, Daisy Noble, Rob van Os, Oeilie Oellerman, and Les Theobald. In the front row are Izaak van Heerden, Bill Payn, Polly St Pol, and Charlie Crewe. The headmaster is Col. A.C. Martin. He retired in 1952 and was succeeded by George Armstrong. The vice-principal seated beside him is A. Goldwater, a legendary and much beloved figure who retired in 1955. Please let us know if you can spot any of our other teachers in the photo!